Recreational marijuana legalization has brought more new cannabis users into the fold than ever before, creating a burgeoning market in states that have launched adult-use sales. So what are these consumers looking for when visiting a licensed shop, and how can businesses cater to this demographic? Recreational customers are a diverse bunch, and their wants and needs differ from medical marijuana patients in some key ways. About a third of consumers in recreational markets are truly new users who didn’t consume cannabis before it was legal in their state, and another third converted from the black market, according to Marijuana Business Daily’s latest What Cannabis Patients and Consumers Want report. The final third either continue to exclusively tap the black market or patronize both licensed and unlicensed outlets. Unlike most long-time medical cannabis patients who are watching the gradual metamorphosis of the industry into a commercial enterprise, recreational customers expect a legal cannabis purchasing experience to be no different than any other retail experience from day one. 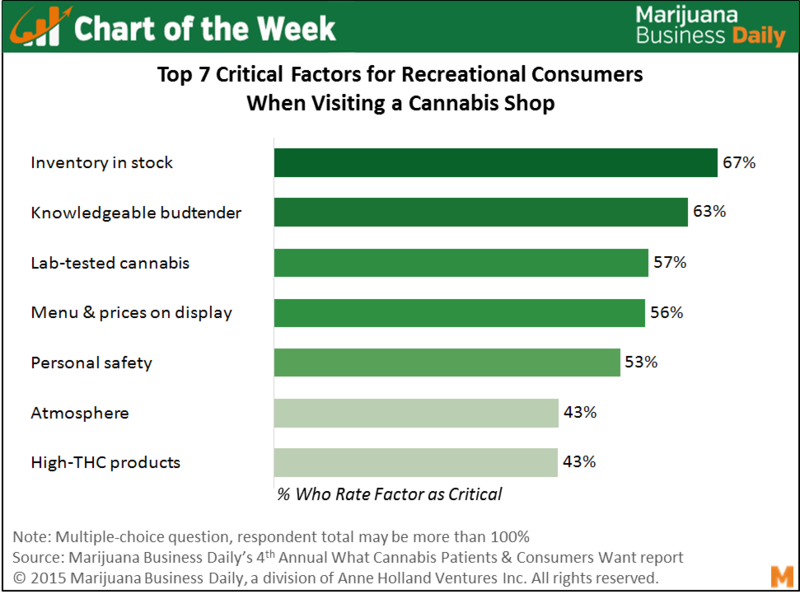 This expectation is reflected in the fact that 67% of rec customers rate consistently stocked inventory as a critical factor when visiting a recreational shop, while 56% say it’s extremely important for stores to ensure prices are on display, the report found. Recreational customers, however, need different types of guidance when making a purchase than MMJ patients. They are less educated on the plant itself when compared to their medical counterparts. And although many rec customers say lab-tested cannabis is a critical factor when visiting a rec shop – as do MMJ patients – most are not quite savvy enough to interpret individual results. Instead, they are looking for that “feel good” factor that what they’re putting in their bodies is safe for human consumption. Like medical users, rec consumers are still looking for a personalized customer service experience, and 63% of them rate a knowledgeable budtender as a must-have. With Oregon initiating early rec sales through existing MMJ dispensaries, Alaska rec shops expected to come online starting in late 2016 and even more states expected to vote on full legalization next November, understanding the preferences of recreational consumers and how they differ from medical users will be critical for businesses that wish to capitalize on this rapidly expanding opportunity.